Create modern maps and atlases using these network paths! Modern Maps: Networks is an asset pack with various paths and symbols inspired by Google Maps and book atlases, allowing YOU to recreate plans and overviews of your contemporary cities! 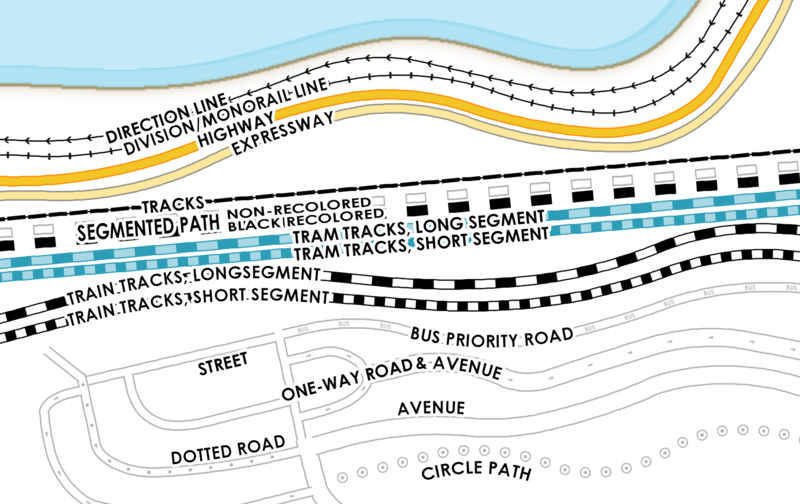 The asset includes custom paths like railways, special roads like bus-lanes, roads, tram tracks and more! Want a seamless connection between roads? Use one of the connector symbols! A list of all included paths and symbols included with this asset can be found below. Do you miss a specific type of path or symbol? Let me know in the Discussions tab! Mixing with Modern Maps: Theme and Modern Maps: Points of Interest yields easy atlas-style map creation! To install, just drop the .zip contents into the assets subfolder in Wonderdraft root directory. Changed HVL to HOV on highway high-occupancy vehicle lane path, added road with diamond symbol. A must-have asset for those who want to create modern maps! Well made and loads of options!